Bordeaux blanc is typically a blend made of sauvignon blanc and semillon. If you went in blind and heard those grapes you’d expect a lighter style wine however these are full bodied whites. Pessac-Leognan is located on the left bank in the north part of Graves. This region is more well known for red (it’s home to the classified first growth Chateau Haut-Brion) however there are some good whites to be found. I think these wines are good alternatives to Chardonnay based whites with meals that want full bodied wines. colonelgrape: 91. The nose was a bit funky: barnyard, hay, with a little citrus sneaking through. On the palate: citrus, limestone/chalk, and toasted oak. It had a little nuttiness to it too. Really liked the mouthfeel…good full body to it. An agressive white but good acidity leads to a long, smooth finish. I picked this up for $35 at Vin Bin and I think it’s fairly priced. I’d pair this with fleshy fish, pasta with cream sauces, and lighter meats like chicken, rabbit, or quail. mobygrape: 88. Initial nose? Farty. After more nosing? Asparagus pee. After getting over it and nosing some more? Kind of woody and musty, and I’m not sure how else to describe it other than pungent. Looks like someone didn’t drink anything for 48 hours, drank a gallon of Ecto Cooler and peed, it’s a very intense yellow color. Are you thirsty yet? This is a serious white wine. It’s more like a white that doesn’t know it’s a white. It’s full bodied and does not want to be paired with some mamby pamby white fish. It’s tart, very full, and would definitely overpower a light fish or appetizer. I don’t think it’s got the cojones for red meat but it would be ready to step into the ring with a heavier fish (salmon, swordfish) or other meat (such as rabbit drowning in delicious mustard sauce). Cheers! 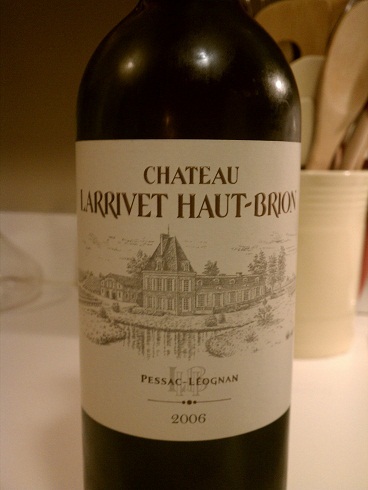 This entry was posted in Bordeaux, France, Pessac-Leognan, Sauvignon Blanc, Semillon on December 3, 2013 by colonelgrape.